Welcome back to our R&Q Q&A series, where we ask R&Q employees how they make their impact at R&Q. This post features Chad Quistad - Director, Intelligence and Technical Excellence. Welcome back to our R&Q Q&A series. Every few months we ask R&Q employees how they make their impact at R&Q... and the impact R&Q has had on them. 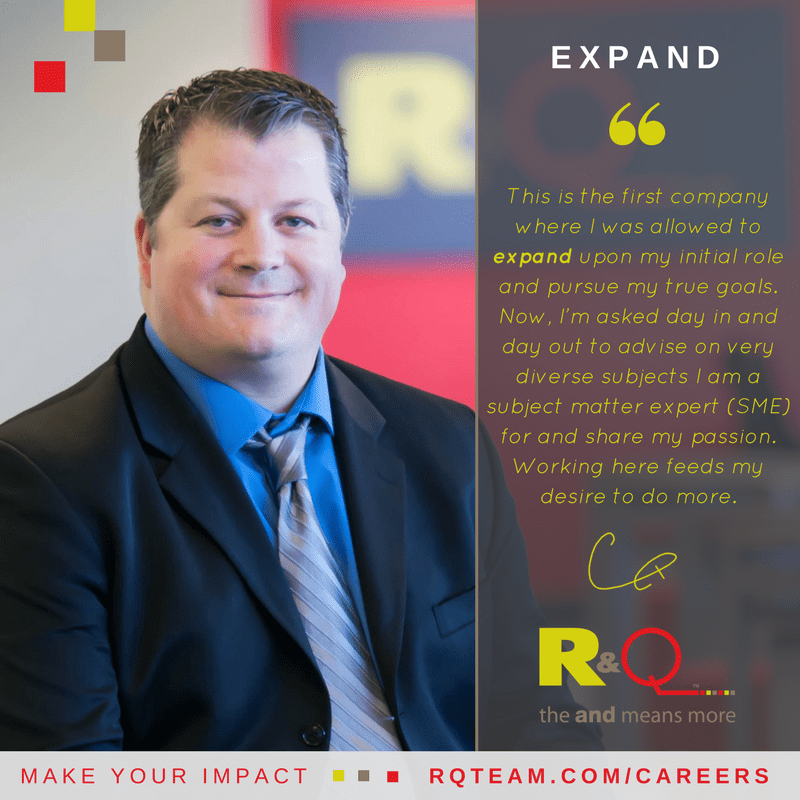 From improving people's lives to R&Q's rewarding culture, we hope their answers shed light on how R&Q influences the medical device industry and why our employees claim time and time again working at R&Q is a highly fulfilling experience. View all R&Q openings on our Careers page. CQ: It was through a current employee who I worked with in the past as a client whom I knew to have the utmost ethics, and amazing talent, and I just had this feeling that this was the right place. Throughout my career I have been told that I teach and mentor well and that I should pursue consulting, but it had to be the right place at the right time. Once looking into R&Q, and through my own dealings with hiring consultants and through peers who have dealt with R&Q, I felt that R&Q just had that difference I wish I knew about when hiring consultants at companies I worked for. CQ: At R&Q, we scale the resources to meet your business needs without pushing your budget. I felt at times when hiring consultants in my past life we were paying too much for the highest tier when we didn’t need it. I have realized a lot of smaller companies don’t have the luxury of budget and need customized solutions for their unique needs. The less they have to spend on us; the more they have in resources for internal expertise to pass through the FDA and the world to innovate, and expand medical technology to truly improve lives. We also make sure we can see what is forthcoming in industry regulations so that you can prepare ahead of time. Waiting to the last second to meet new regulations could potentially put your business at risk. Now and more than ever in my 16-year career, things are moving more rapidly... and that requires proactive planning and knowledge on how to execute. What’s unique about our culture? CQ: Everybody, and I mean everybody, helps each other out. Even recently a major question came up and within three hours, there were five expert responses in order to ensure that the right answer was being given to the client. "The and means more" is more true here than any company I have every worked for. You not only get me, but you get the amazing pool of company expertise at your disposal. This type of help sometimes takes months in industry. 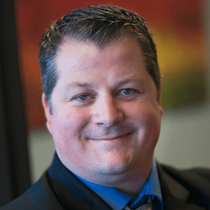 What’s different about being a consultant at R&Q? CQ: No matter what client I go to, and especially those who have dealt with R&Q before, they have nothing but excellence to say. With my past peers, experience with consultants, and current discussions... there are very few, if any, consulting firms that we have dealt with we can say the same of. The biggest theme I tell my industry peers is that “pretend you are working with the best of the best in your company every day on every project.” Well, that's R&Q! There is truly elite talent and very high morals and ethics here. Everyone is trying to make you a better version of yourself. There is nowhere in industry and in my experience that I can even say that with 50% confidence. Honestly, that starts with how this company’s principles was founded upon and how we hire the talent we have. CQ: This is first company where I was allowed to expand upon my initial role and pursue my true goals. Now, I am asked day in and day out to advise a very diverse amount of subjects that I am a subject matter expert (SME) on and share my passion. I have a passion to ensure that not only the industry in general through quality and regulatory intelligence is able to plan far ahead of time to ensure that their device will go through the FDA and worldwide regulatory bodies with minimal disruption, but all those within R&Q are aware of as well to best serve their clients, and also the most critical of all... that my family, friends, and everyone else in the world gets the best technology available without regulatory hiccups and delays. That's what matters in the end. CQ: We are on a clear path to make sure that any medical device/pharma/biotech company has no disruption of their business in order to assure that their device/combination product will get to the market and serve the better good with no disruption at the highest possible quality... and at minimal external cost. What makes working at R&Q special? CQ: It feeds my passion in order to communicate to the greater good outside of myself. There needs to be a clearer path and communication on new regulations for those not only inside the industry, but especially the available knowledge to the public about currently approved medical devices and combination products. R&Q allows me to feed this passion and ensure the best possible communication is optimally communicated. We are looking for regualtory professionals to collaborate with our team of experts to help guide clients through these challenging times. This is an opportunity to leverage your experience, be an advisor in your space, and capitalize on this distinct time in the industry. What’s more, R&Q offers continuous training for our consulting team, allowing us to keep up with the changes and deliver only the best for our client. We have a number of quality engineering positions available in multiple locations that will represent R&Q on client projects in medical device QA/RA. These are excellent opportunities for varying levels of experience. We are seeking medical writers to support the development and creation of Clinical, Scientific, and Regulatory documents in accordance with procedures, European Medical Device Regulation, and US FDA requirements. This includes, conducting literature reviews, assisting and writing Clinical Evaluation Reports, analysis of product complaints and trends, collecting and analyzing feedback from various sources to support the CER. 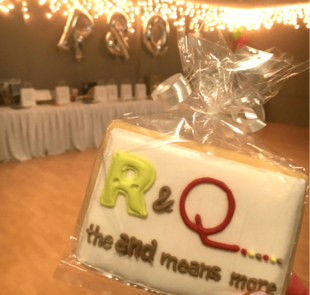 R&Q is all about people, culture, community, and connectedness. We want to get to know you, whether there's a current opening or not! We want to hear from you, chat with you and learn more about you... and job postings get in the way of that! We want to have real conversations with you and give you a chance to interact with us by introducing yourself, asking questions and getting the answers you seek. If we both already know each other, then we'll know exactly what type of role is perfect for you if/when a position becomes available. We're adding to our team nationwide!